PRESIDENT Mnangagwa yesterday met Estonian President Eesti Vabariigi and the two leaders discussed economic cooperation. President Mnangagwa and President Vabariigi met in Addis Ababa, Ethiopia, after attending the official opening of the 32nd Ordinary Session of the African Union Assembly and two leaders had talks on bilateral cooperation and opportunities in the field of digital technologies. President Mnangagwa’s closed door meeting with President Vabariigi lasted close to an hour. President Vabariigi described the engagement as very fruitful. 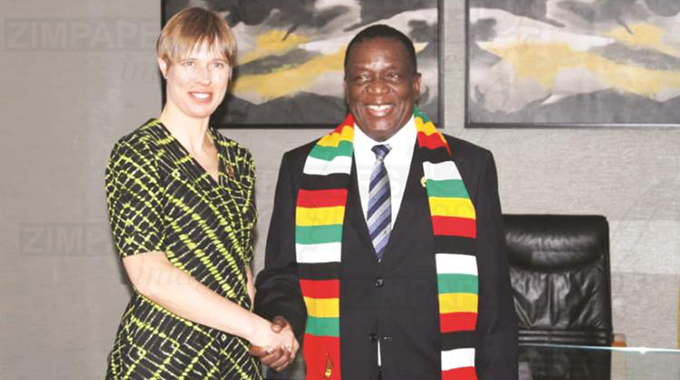 President Vabariigi said Estonian companies had already visited Zimbabwe to explore potential areas of investment and cooperation. Foreign Affairs and International Trade Minister Sibusiso Moyo, who also attended the meeting, said President Vabariigi wanted to find out more information on Zimbabwe when she paid a courtesy call on President Mnangagwa.